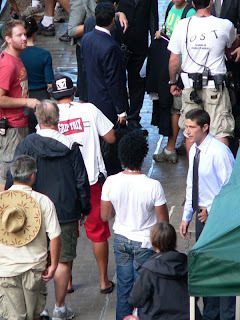 Update: 21:40 GMT Thanks to Ryan for some new shots of the filming. You can see more at his Flickr Page here. Thanks to DarkUFO reader Quickdraw for the following. 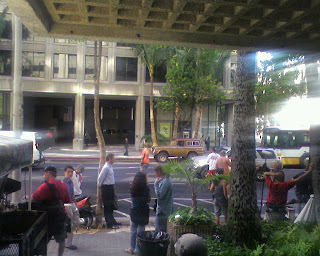 I work at a building on Bishop Square downtown, and as I was driving into work this morning (09/24/08) I noticed film crews at the corner of King and Alakea. 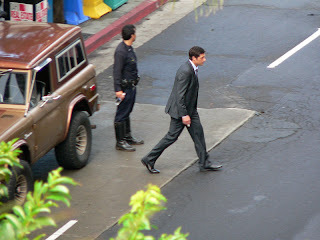 As I drove by I saw Jack’s truck parked on one side of the street, and Kate’s Volvo on the other side. 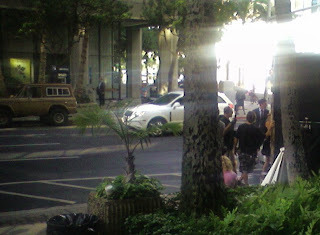 Evangeline Lilly was sitting in her car, and Fox was standing next to the truck as traffic was let through. 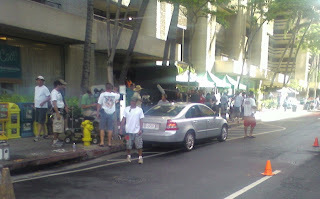 I parked my car really quick in my garage, and ran down to walk by the filming. Essentially, Jack was parking his truck, got out and walked over to Kate parked across the street. 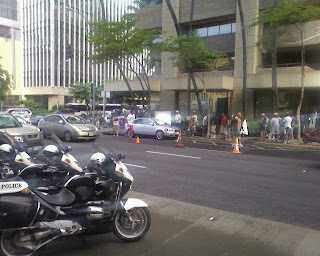 I took some shots (attached), but they were from my camera phone, so they aren’t the best, sorry. But you can definitely make out Jack’s truck and Kate’s car, and in the forth picture you can see Jack (between the trees with his head turned).